Partners in Population and Development (PPD-www.partners-popdev.org), an intergovernmental alliance of 26 developing countries, is seeking to recruit an Executive Director (CEO) for the organization. PPD is leading the promotion of South-South Cooperation towards the attainment of the global population and reproductive health agenda for sustainable development. PPD’s key strategies include senior level advocacy and policy dialogue, capacity building, sharing experience and good practices and building strategic partnerships. PPD is a Permanent Observer at the United Nations and has Diplomatic Status in Bangladesh. 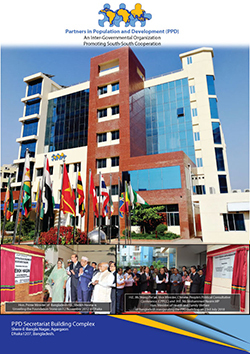 Headquartered in Dhaka, Bangladesh PPD has Permanent Observer Office in New York, USA, Africa Regional Office in Kampala, Uganda, and Program Office in Taicang-China. Reporting to the Chair of PPD and, as the Head of the Secretariat, the Executive Director will be directly responsible for mobilizing political and financial commitments, raising awareness about South-South Cooperation, representing PPD in the international forums and leading the development and implementation of PPD’s Strategic Plan. Minimum qualifications required for the position is a PhD Degree in social, population and development studies and/or public health sciences, or a medical doctor with post-graduation degree in the related field, and 15 years of relevant professional experience in reproductive health, population and development, including 5 years in a senior position in inter-governmental organization, international development agencies and 5 years residence in a developing country. Successful candidates are likely to have an outstanding track record in mobilising funds from donor agencies, governments, multilateral organizations; managing multi-country projects with a wide range of stakeholders from varied cultural settings; and excellent communication skills in English. Fluency in French language is an advantage. The position is open to the citizens of all countries. The appointment is for an initial period of three years inclusive of 6 months probationary period, renewable subject to satisfactory performance. For further information, interested candidates are encouraged to visit PPD website: www.partners-popdev.org. The application should be submitted by 31 May 2018 along with detailed Curriculum Vitae (Prescribed CV format available at: https://goo.gl/4wNVWK), a recent colored photograph, academic transcripts and professional credentials including a statement highlighting the vision of priorities and strategies to take the organization forward in the context of its founding mission and mandates.